Bradley Central junior Anna Walker makes a move for the goal Tuesday night against a William Blount defender in their high school basketball game Thursday night in Cleveland. Walker scored a game-high 17 points as the Bearettes romped to a 58-18 victory, the 2,200th all-time in the program's history. 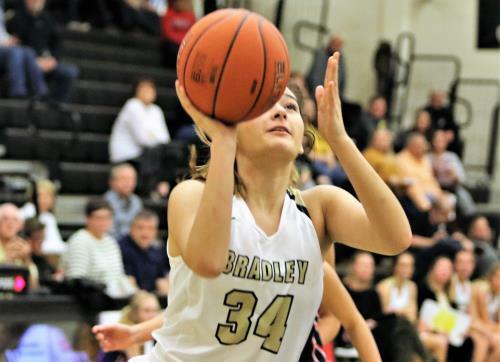 CLEVELAND, Tenn. – Winning is a huge part of the Bradley Central Bearettes’ rich basketball tradition. So, it was no big shock when the Bearettes raced to a 14-point, first-quarter lead and eventually trounced visiting William Blount, 58-18, behind Anna Walker’s game-high 17 points at Jim Smiddy Arena on Thursday. It was Bradley’s 2,200th all-time victory against 486 losses with nine ties for a winning percentage of 82 percent. “We really improved from our first game,” said Walker, a junior post. In the boys’ game, the Bears knocked off the Governors, 72-63, in their season opener as sophomore wing Tray Curry poured in 30 points. Saylor Clark scored 11 points and Mason Rothwell added 10. The Bearettes (2-0), who are 99-6 in the last three-plus seasons, jumped out to a 20-2 first-quarter lead, built the margin to 33-6 at halftime and cruised to the easy victory. Walker scored five points and blocked a shot in 1 minute and 18 seconds of the game. Bradley had an 11-0 lead when the Lady Governors (0-1) scored. Walker made two free throws, junior Alexis Barnes made a layup, Jamaryn Blair drained a 3-pointer from the right wing and Barnes scored again for the quick 20-2 lead. The Bearettes forced 28 turnovers, 16 in the first half. Barnes and Walker hit field goals to start the second period and the Lady Governors’ Jenna Kallenburg hit a floater to break the Bearettes’ mini-run. Bradley outscored William Blount, 9-2, down the stretch with four different players scoring and pushed the lead to 25 points. 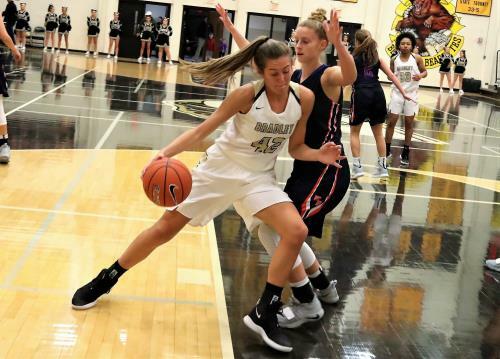 The Bearettes scored 26 points off William Blount turnovers, outscored the visitors, 40-12, inside, 13-1 on second-chance opportunities and 12-0 on fastbreaks. That has been a consistent pattern over the past three-plus seasons. “We wanted to go fast right off the bat and play how we usually play,” said Walker, who made 7 of 14 shots from the field. She also had five rebounds, four assists and three steals. “Anna Walker is our most improved player,” Reuter said. “It’s like growing a crop. You have to nurture it, cultivate it and Walker has been doing this a long time. She has taken the biggest step from last year to this year. Reuter voiced mild concern about his team’s 3-point shooting after two games, but the veteran coach isn’t ready to the panic button. The Bearettes were 11 for 42 (26.2 percent) from 3-point distance against Baylor in the opener and followed that effort by making 4 of 18 (22.2 percent) on Thursday. “We went 11 for 42 and people might say Howard Rhyne (the ex-Bearette great now at Kentucky) left and coach Reuter has sold his soul to the 3-ball,” he said. “That’s not the truth. What happened was Baylor gave us that shot. We got four open 3s in the first two minutes against William Blount and missed all four. Game officials invoked the TSSAA mercy rule in the final four-plus minutes when the Bearettes were up 49-13. William Blount’s 18 points were the fewest the Bearettes have allowed since holding Baylor to 16 points in a 39-point win on Nov. 25, 2017. Bradley boys 72, William Blount 63: The Bears had a 32-26 lead at halftime and the lead was 42-39 in the third quarter. Bradley (1-0) scored eight of the final 10 points and had a 50-41 advantage going to the fourth. Tyler Ferguson made two free throws to start the spurt. Curry then hit a left-handed layup and four more free throws. The Governors trimmed Bradley’s lead to 57-48 on Jordan Tarver’s bucker with 5:43 left in the game. Saylor Clark, a junior guard, dropped a layup, Curry zipped past a defender on the baseline for a dunk and freshman guard Quante Berry made a layup – all coming in a 52-second span – and the Bears pushed the lead to 63-48. Curry scored 10 of his 30 points in the first quarter and had 14 in the second half. William Blount got back to within 68-59 but, with 55.2 seconds on the clock, it was not enough. Clark finished with 11 points and Mason Rothwell contributed 10 points that included two 3s. William Blount (18) – Shepherd, Walker 2, Hartgrove, Joseph, Kallenburg 2, Tillie 2, Kelly 2, Sara Kegley 5, McKenna Myers 5, Combs. Bradley Central (58) –Hughes 2, Roberts, Blair 3, Anna Walker 17, Lombard 8, Barnes 6, Reuter 4, Williams 4, Carman 2, Estrada, Falcon 2, Crittenden 2, Mayo. 3-Point Goals – William Blount none, Bradley Central 4 (Blair 1, Walker 1, Lombard 1, Williams 1). William Blount (63) – Prats 4, Pride 5, Brett Boling 11, George 3, Reardon 17, Deering 4, Young 3, Jordan Tarver 12. Bradley Central (72) – Boyd 5, Saylor Clark 11, Tray Curry 30, Whaley 6, Ferguson 4, Mason Rothwell 10, Berry 4, McCleary 2. 3-Point Goals – William Blount 7 (Reardon 3, Pride 1, Young 1, Tarver 1), Bradley Central 5 (Rothwell 2, Boyd 1, Curry 1, Whaley 1). Junior Alexis Barnes of Bradley Central eyes a shot Tuesday night against William Blount. Barnes made 3 of 5 shots for six points in the Bearettes' lopsided 58-18 win to go 2-0 on the young season.